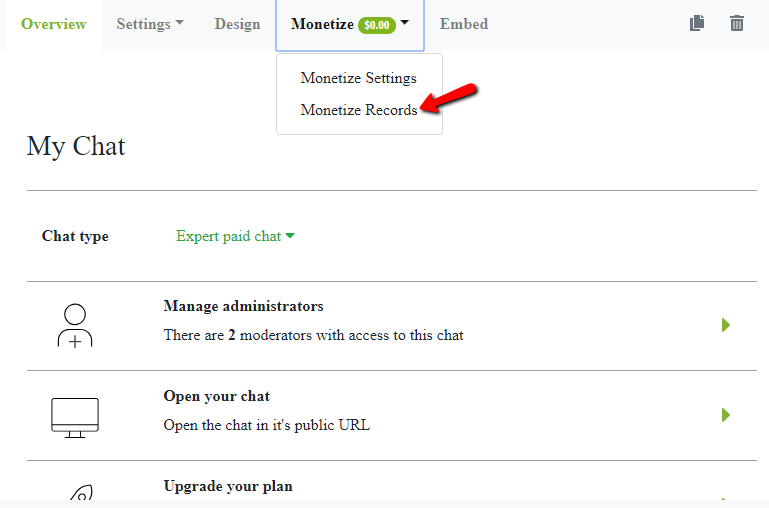 Did you know you can get paid directly on your chat? Let me explain. Most chats are pretty simple. Users sign up with an email address or sometimes they can log-in with their social media accounts, and then they can use the chat room. 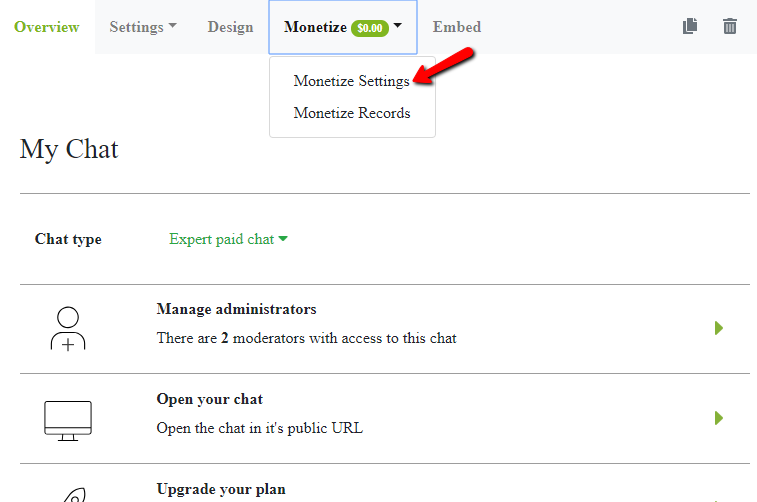 It’s rare to find a chat that has been properly monetized, let alone allowing for subscription-based chatting! However, using a paid access as a feature can be a great way to improve the quality of your hosted chat room. That’s why we now offer paid access (paywall) option in the chat. Installing a paywall is all about making money from your chat. Not only that, but it also guarantees that everybody in the chat really wants to contribute and take part in the discussion. 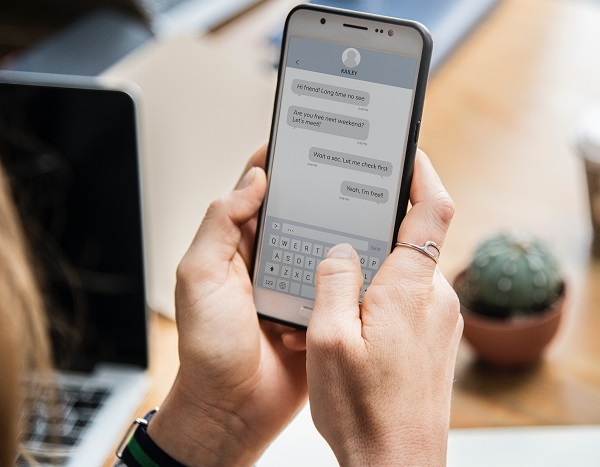 Moreover, if the users in your chat often discuss sensitive or private topics, a subscription-based chat or a paywall service can help them feel more secure, just like the warmth of your own home. This makes your chat a safer place to share these kinds of topics. 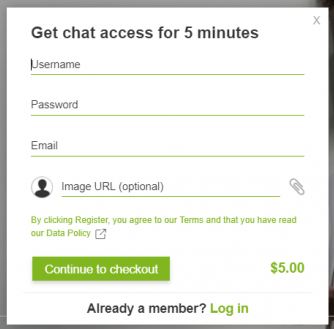 We offer many features for chatting and one of them is using a paywall. With a paywall, you can use paid access for your chat. How do you do it? Read on to find out! First of all, you need to adjust your settings. 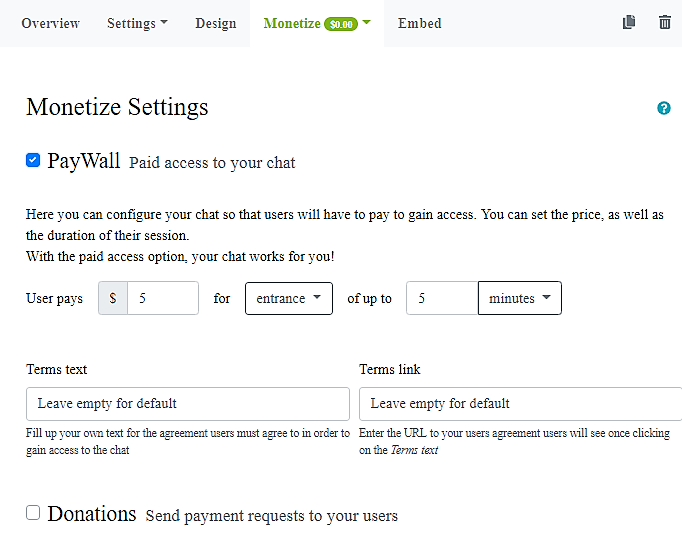 You need to choose the chat type that’s right for your website and apply paywall. 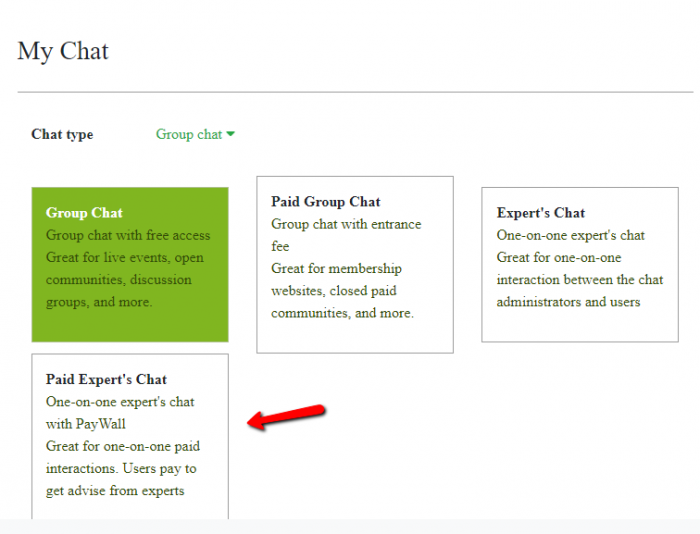 I recommend choosing “Paid Expert’s Chat” so you can go more than the normal chat. You can earn money through the chat room! Next, to the good part. You can now add the paywall feature. That’s where the good stuff is. You just have to check the box for paywall and you’re all done! This is just an additional tip. 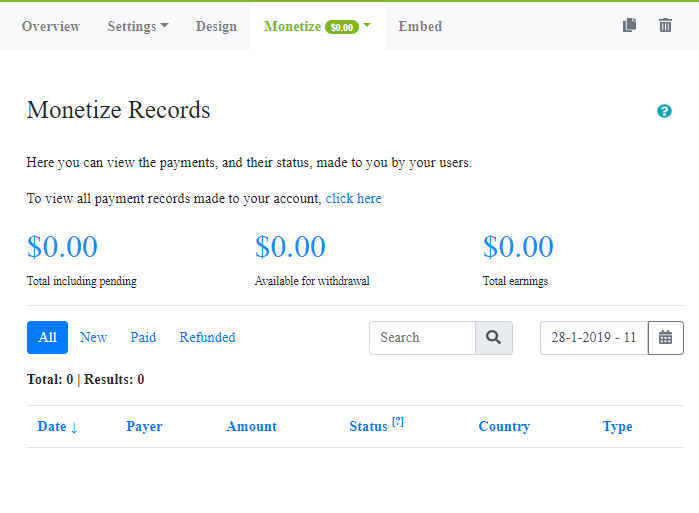 If you want to check your payment records, go to “Monetize Records.” You will see here all the payments made to you and the money you now have. All you’re left to do is transfer it to your account. It’s as easy as that! For the last step, here’s an example of the log-in when you apply subscription-based chatting. This is where chatters need to add their credentials before they can enter the chat room and pay an entrance/subscription fee. Now, here comes the serious part. But, don’t skip this! This is important if you want to know the benefits of chatting with paid access. Don’t blame me if you didn’t get to read this. I warned you! 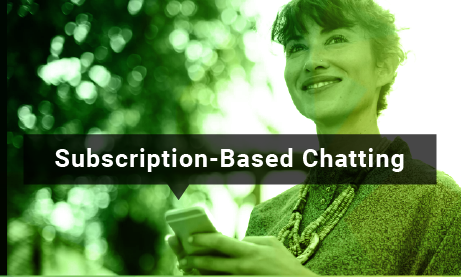 Of course, subscription-based chatting isn’t the only option to improve the chat experience for your users. For example, let’s say you primarily use your chat for webinars or perhaps live events. Then, you can also allow users to purchase a limited-time pass. This allows you to determine a price for a certain amount of time users can be active in the chat. Whether it’s minutes, hours, days, or even months, this tool is the perfect way to let users have one-time (although limited-time) access. Best of all, you, as the chat owner, define the price and duration. This can be the perfect solution for chats that have lots of one-time events or are active for only limited periods of time. This type of chat could include webinars, video sessions, virtual training sessions, and more. If used correctly, paywalls can be an incredibly effective tool. Advertising your chat as a high-quality, low-price opportunity to connect with other individuals or even organizations can give it the boost it needs. Because of the hundreds and thousands of chats that fill the internet today, many of which are completely generic and don’t have all that much value to the user, offering a unique chat can make all the difference for you and your website. In a world filled with scammers, spammers, and frauds, offering a safe space to chat and communicate freely can be a relief to your users and you alike. In addition, this type of monetization has other uses, too. For information that should only be available to a limited or specific audience, this can be the perfect access restriction tool. The expert’s chat feature lets you set your own price and also dedicate what sort of time frame your users purchase access for. This means you can make it as cheap or as expensive as you need it to be (view all of our features here). Sometimes, you may feel the need to keep the number of participants as low as possible. Even if it’s advice from therapists/counselors or trading gurus. This makes a paywall the perfect tool. Although a password-protected chat can achieve the same result, there is always the risk of users claiming a spot and then not participating. This risk is significantly lower if they paid a small fee to join in. As a result, they will be making the most out of that payment. This new feature makes collecting money for a cause possible. Whether it’s a project, a charity, or a crowdfunding project, dedicating the funds earned through a paid access chat to a good cause can be a great way of combining access restriction, content control, and supporting those in need all at once. We only collect a 10% fee from the predetermined amount. This tool can also make a way to donate to charities or other good causes. Therefore, if you’re ready to enter the world of subscription-based chatting, let us be your guide! With our paywall feature, you can try all sorts of payments, from low price points to high ones. Just know your audience and you’re good to go!